Common Car Paint Destroyers to Avoid! Quite often damages to your paint job can be unavoidable, especially if you’re driving your car everyday. Scratches, dings, and exposure to the elements are all a part of life… but having said that, there are a number of common car paint killers that can potentially be avoided! We’ve listed a few common car paint damages for you to keep in mind to avoid, and hopefully preserve your car’s sleek exterior as long as possible. Coffee. Essential for us, disastrous for your car’s paint job. Coffee and other caffeinated drinks such as Coke are extremely acidic substances. 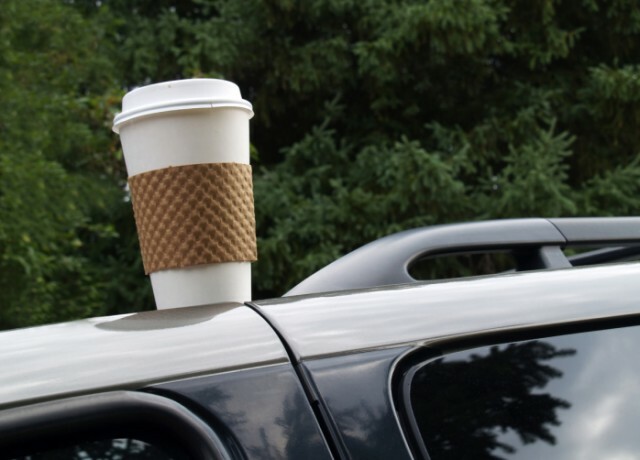 If you spill them on your car… make sure you wipe them off as fast as possible. Writing Messages. Though you may think it’s hilarious to write funny messages with your finger on a dirty/dusty panel (and sometimes it is hilarious), unfortunately, pressing dirt/dust against the panel can permanently scratch the paint like sandpaper. Keeping your car clean is the best way to avoid pranksters. Dead Bugs. Dead bug guts on the front of your car are often unavoidable; however leaving them on to dry can make them near impossible to remove without professional detailing. Try and wash them off regularly to avoid permanent splatter. Construction Zones. Whenever possible, try to avoid driving through, or parking directly near construction areas. Loose gravel and other debris can easily be flicked up to damage the paint on your car. Bird/Bat Droppings. No, it’s not good luck. Getting dropped on whilst driving may be unavoidable, but its worth checking to see if you’re parking under a tree that roosts birds or bats, because their acidic droppings can permanently damage car paint. Salty Breeze. Living near the beach is a great Australian luxury, but be careful not to park your car regularly in a spot that has direct impact from an ocean breeze, as salt particles travel through the air and over time will corrode your paint job. Though water is not going to damage your car… if you’re parking in the same spot everyday, with the same exposure to an automated sprinkler system, those consistent water droplets can be burned in to your paint job by direct sunlight. Eggs. As silly as this may sound, if you are one of the unlucky ones to have your car egged by someone who thinks this is funny, wash it off as quickly as possible. Not only can eggs permanently stain your paintwork, if left on long enough can act as a paint stripper!! If you noticed any of these paint damages already on your car, contact the professionals at Bodyshop Paint Supplies Bayswater to discuss your best options for car paint restoration!